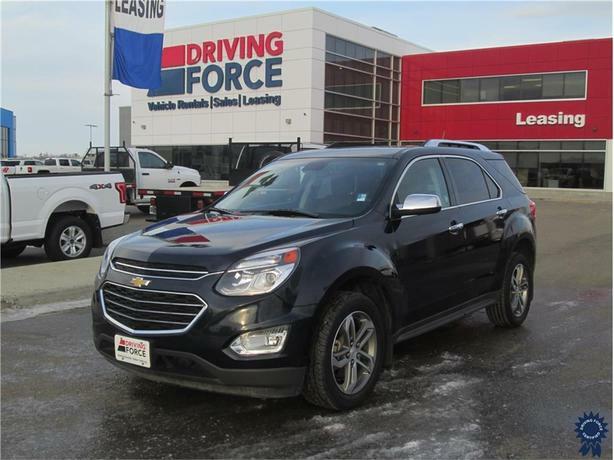 This 2017 Chevrolet Equinox Premier 5 Passenger All Wheel Drive SUV comes with a 6-speed automatic transmission with over-drive, blue velvet metallic exterior color, leather seats, Chevrolet MyLink Radio with 7-inch Diagonal Color Touch Screen Display, AM/FM/SiriusXM satellite capable radio, engine block heater, custom moulded front and rear splash guards, all-weather floor mats, 120-amp alternator, power-assist electric-variable steering, 18-inch aluminum wheels, front halogen fog lamps, auxiliary input jack, Bluetooth hands-free calling, backup camera, heated driver seat, smart device integration, remote engine start, tire pressure monitoring system, and GVWR rating of 5,070 lbs (2,300 kgs). The 2.4-litre 4-cylinder gas engine provides 182 horsepower at 6,700 RPM and 172 lb-ft of torque at 4,900 RPM. Touch base with us to discuss purchasing or financing options that are right for you and experience the difference you will only find at DRIVING FORCE Vehicle Rentals, Sales and Leasing.